From active journeys, safaris and adventure cruises to cycling holidays, expeditions and extreme sports, people are increasingly shunning the traditional resort holiday in favour of a break that pushes the boundaries. With this being the case, it comes as no surprise that adventure travel continues to be one of the fastest growing and most exciting sectors of our industry. For some, adventure is all about reaching for new horizons with treks to Kilimanjaro, mountain biking through Iran, rafting down the Zambezi or Ski in Alborz Mountains. For others the emphasis is on unusual cultural interactions – spending time with the Saami in Lapland or the Fishing in Caspian Sea – while many more look to activity sports, off-the-beaten-track experiences, or exceptional wildlife encounters as their definition of the word ‘adventure’. The common denominator for all is that settling for the mundane is simply not part of the game plan. This tour takes you to Mashad (Iran’s holiest city), Persepolise, Isfahan, Shiraz, and Yazd to visit the most astonishing ancient and Islamic architecture. Upon early-morning arrival in Tehran, you are met at the airport and transfer to the hotel. After a short rest at the hotel, we spend all day visiting the capital’s Archaeological, Golestan Palace and Carpet Museums. Overnight Tehran. Flight to Mashad Visit the glory of Islamic world Holy Shrine of Imam Reza, , the Timurid Gohar shad Mosque, the Bagh e Khajeh Rabi decorated with beautiful tiles and painting. Overnight Mashad. Excursion to Naishabour, the home town of Omar Khayyam world famous Persian poet, to visit his tomb, the mausoleum of Shiekh Attar, the 13th century mystic Sufi poet, the mausoleum of Kamal-ol-Molk, the 20th century poet and artist. Return to Mashad. Overnight Mashad. Excursion to Tus to visit mausoleum of Ferdowsi the great poet and the author of Persian National epic Shahnameh (books of the kings), return to Mashad for the flight to Tehran. Overnight Tehran. 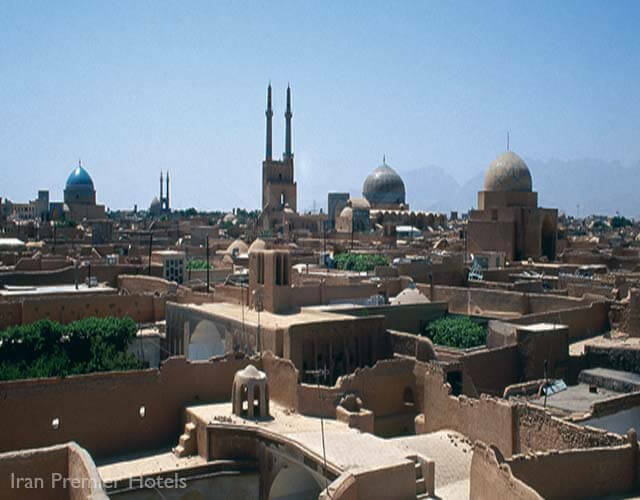 We drive to Kashan (285km 3-4 hours) and visit the Royal Gardens of Fin, with its historical bathing-house Agha Bozorg Mosque, Sialk Mounds, a settlement belong to approximately 4,500 BC. Overnight Kashan. Our day consists of a leisurely drive on to Yazd, (371km 4-5 hours), on the way visit village of Abyaneh known by UNESCO as a historical village. 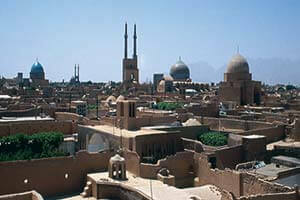 Overnight in Yazd. We visit the Towers of Silence,(Zoroastrian’s commentary) â€“ where the dead were left to be picked clean by the vultures the Friday Mosque, dates back to the 14th century with tallest minarets in Iran and the Fire Temple, the fire has supposedly been burning since 470 AD. Amir Chakhmagh mosque, one of the most valuable artistic historical heritages. Drive to Shiraz. Overnight Shiraz. Sightseeing in Shiraz, visiting the Eram Garden, a typical Persian garden with a 19th century palace. Hafez and Saadi Tombs, Shiraz is closely linked to the great poets Hafez and Saadi. and the then colourful Vakil Bazaar. Overnight Shiraz. Excursion, this time to Persepolis, “Ancient Capital of the Achaemenian Kings”Naghesh-e-Rajab a site of four limestone rockface inscriptions and bas-reliefs that date to the early Sassanid era. and Naghesh-e-Rostam, the tombs of four Achaemenid kings, these are two archaeological sites candidate for UNESCO World Heritage. Back to Shiraz. Overnight Shiraz. We continue to drive to Isfahan, (484km 6-7hours) en-route stop at Pasaragde to visit the tomb of Cyrus the Great, founder of Persian Empire. Overnight Isfahan. A full day sightseeing, visiting Imam Mosques with its most stunning architecture, Sheikh Lotfollah, a 16th century ladies’ mosque the Aliqapou Palace, the 18th century as a functioning seat of government Vanak Church, 17th century Armenian church , the Shaking Minarets, these minarets have the unusual feature of moving from side to side when shaken vigorously, and the Fire Temple. Overnight Isfahan. Sightseeing in this fascinating city continues with the Friday Mosque, a treasure architecture, Chehel Sotoun, which was built as a reception hall by Shah Abbas II in 1647 Hasht Behesht Palace with fine murals and spectacular roofs, Khajou Bridge ,built by Shah Abbas II in 1650, it is 123 metres long with 24 arches. Overnight Isfahan. Drive to Tehran, (435km 6-7 hours), en-route visiting the pilgrim city of Qom. Overnight in Tehran. Transfer to the airport for the flight to London.